This post about Easy Football Cake for your Game Day Menu is sponsored by I Love Ice Cream Cakes. All opinions are my own. 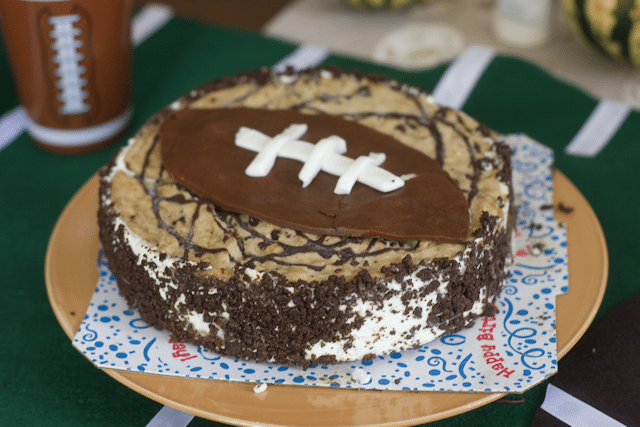 Hosting a football party and wondering what themed party desserts you could make to celebrate your team and your guests? 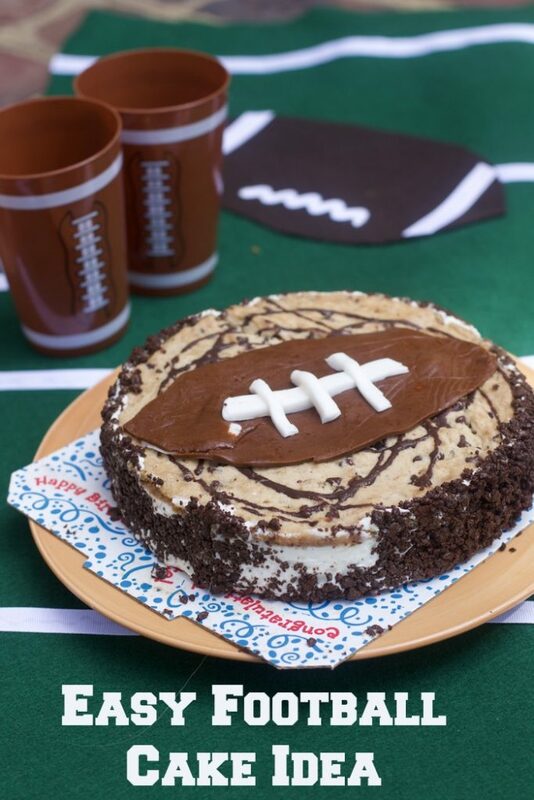 This no-bake football cake is not only going to be a crowd pleaser, but also a no-stress win for the host. With just a few easy cake decorating tips, you can serve a fun Sunday football cake that looks like you spent all day on. Who really has time for that when there is football to be watched? Be sure to check out our Easy Halloween Party Ice Cream Cake too. 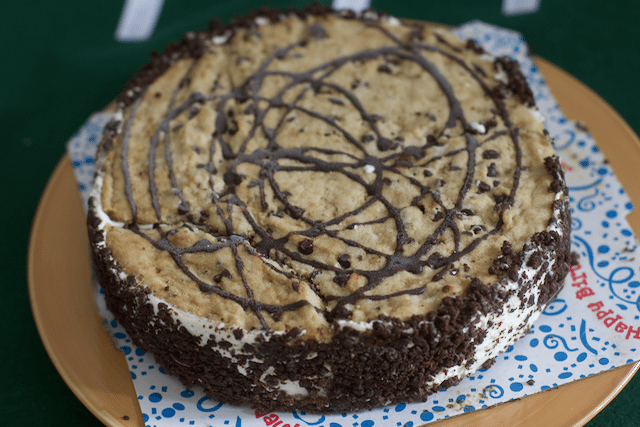 We love to make our own ice cream cakes, but I would have never thought of making a gigantic chocolate chip cookie into an ice cream cake. Thankfully, I Love Ice Cream Cakes thought this one up for me with the NEW! 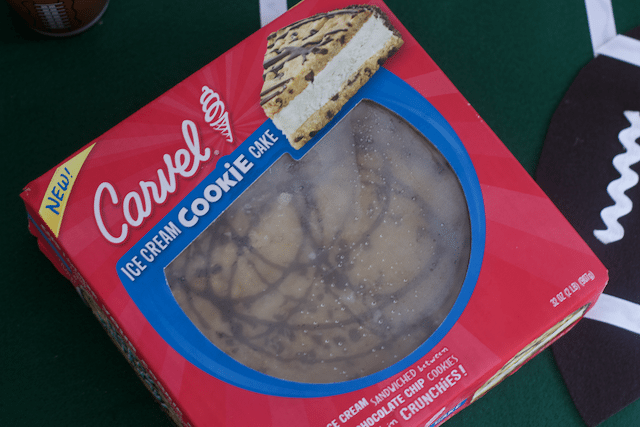 Carvel® Ice Cream Cookie Cake. I Love Ice Cream Cakes showcases delicious frozen ice cream cakes for all occasions, in many different styles and sizes, available in the bakery or freezer aisles in grocery stores nationwide. This handy Product Locator makes it easy to locate Carvel® Jon Donaire® , or OREO® cakes in your area. 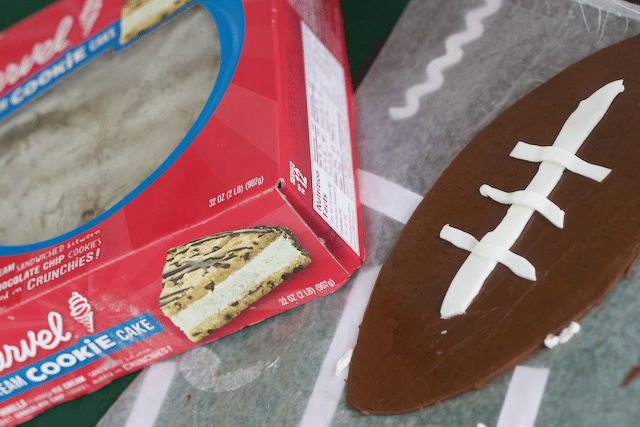 Transform your Carvel® Ice Cream Cookie Cake into a football cake with a little fondant. I have never worked with fondant before but found these pre-made fondant colors so this was a no brainer in my mind. Using fondant, create a football to adorn the already amazing Ice Cream Cookie Cake we found at Wegmans right here in Richmond. 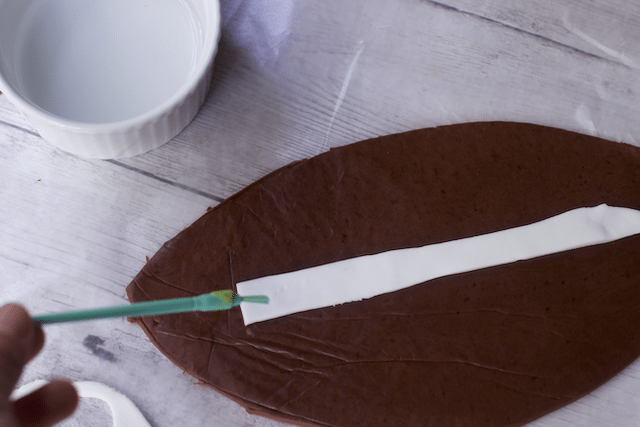 Before rolling out your fondant in between wax paper, measure your cake and then make your template. I did not and had to make some last-minute adjustments! All you need to attach the different color fondant pieces is a dampened pastry brush. Create the football ahead of the party, but just be sure to wrap it carefully in plastic so it does not dry out. 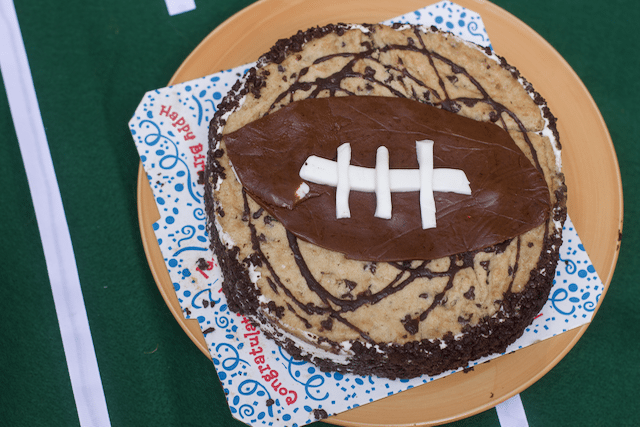 When you are ready to serve your football party desserts, simply take out the Carvel® Ice Cream Cookie Cake and attach your fondant football to the top. Your Ice Cream Cake needs to sit out a few minutes before slicing, so this works out perfectly. Check out this fun transformation from a delicious looking cake, to the perfect football game-day food. Feel free to decorate the plate with your favorite team colors too. We were just keeping it simple. Display your cake on a DIY Game Day Runner that was also a simple new sew craft. See how easy it is to make football party desserts?! Just wait until you serve your guests a cool, creamy slice of crunchie covered deliciousness. Be sure to join the I Love Ice Cream Cakes Crunchie Club and automatically get a $5 off coupon add this to your game day menu. Thanks Brandy. Hope they like it. We love ice cream cakes….it’s what my kids ask for every year on their birthday! Love the cute football topper you made! Oh this looks like something I made recently, so I love it. 😉 So great for game nights. That is such a fun and easy way to decorate a cake for football parties. I think my family would enjoy this! Our State is hosting the big game this year… and of course we have to decide what party to attend, this would be a great thing to make and bring. Wow I am in love with this easy to make football cake for game day. I love that you shared this, because I am going to share with my football fan friends.